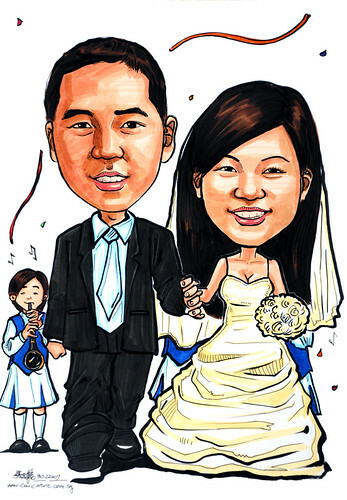 "1) my fiancee and i would like to be in wedding gown and suit in the drawing. 2) We got to know each other in the school military band so can we have some people at the background with our band uniform as per pic attached (pic 6 & 7) playing some instruments? 4) My fiancee will like you to draw her with long fringe as per pic 5 and also she would like to have longer eye lashes in the drawings"